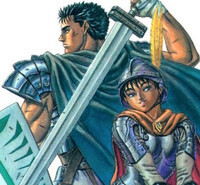 Last month we posted the first part of a translated Berserk article from home anthology Young Animal that featured a discussion between author Kentarō Miura and legendary former editor Kazuhiko Torishima. Now, at long last, it's time for the second part! Thanks to Rei Miyasaka for the translation work. Miura: I get the impression from talking to you that you’re someone who really values your use of words. Torishima: Of course. An editor’s work is from the neck up. You see with your eyes, hear with your ears, and speak with your mouth. That’s what an editor is. And the mind is something to be expressed, not something to make decisions. Q: President Torishima, how do you think the editors have changed since your time as an editor at Weekly Shonen Jump? Torishima: They’re just not as great as they used to be. Miura: Do you notice anything different about the youth now, in the Internet age, and youth before the Internet? Miura: I’m not sure I’d say we live in a fulfilling time. Torishima: Put bluntly, hunger is the greatest spice. That holds true for information, too. Miura: But those are the kinds of people who are our manga readers. Torishima: That’s the real question: Are those people really our audience? Torishima: Who do you write manga for, then, Miura-san? Miura: Personally, I write for “someone who is like me.” I don’t think my manga can be appreciated by anyone beyond those people who share my sensibilities. I want to write for the people who are like who I was during high school. Torishima: That’s not quite my thinking, but I think that’s a very honest answer. If I were the editor, I would want to create manga for people who are stuck on the ground. I want to save them by giving them the wings of fiction. Because when I was a kid, when I was without freedom, it was words and books that gave me flight. Miura: Huh. I guess personal experience really does shape things. There’s really no reason to put personal feelings aside to create manga, for example, for the sake of your company or for the sake of society, is there? Torishima: Absolutely, there isn’t. Authors don’t need to worry about that kind of thing, but editors do. Q: By the way, President Torishima, what do you think is the most important skill for an editor to have? Miura: Some of my friends are egotistical, and yet their egotism is what makes them interesting people. Torishima: Exactly. You mustn’t forget what it is that you need to do. Miura: Earlier (in the previous half), we talked about Chapter 13. 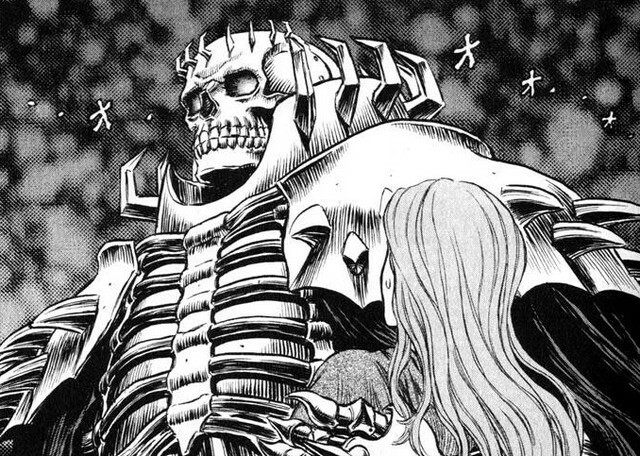 May I ask you what your honest feelings are about Berserk as a whole? Torishima: To be honest, it’s a painful piece. As I said before, it’s been implemented wrong. You’re good at establishing a theme before you write, but unfortunately, you’ve written it with a certain detachment. And you’ve done a lot of research in order to dig into the theme, which you try too hard to convey through dialogue. I think, if I were your editor, I would cut down your dialogue to a fifth and your shots to a quarter. Why? Because you have even more skill in your use of dialogue than you do in your art. Your artistic ability is absolutely amazing, of course, but your true strength is in your dialogue. There’s love in your dialogue. You must be a very kind-hearted person (laughs). Torishima: I’m not flattering you. And I think you rush to your characters’ developments too quickly. The audience is seeing things three times as fast as you are. Miura: I’ll be dead by the time it’s done (laughs). Torishima: I think that’s fine, too. There’s no rule that says that you have to finish. So long as you have something about your characters that you want to express, and so long as you’re headed in that direction. Miura: Personally, I like depicting characters, but I like electrifying stories, too, and I become tempted to write those as well. Torishima: I think that’s something of an illusion. I think by depicting characters, stories will come naturally. Another thing is that you, yourself, mustn’t take on the perspective of an editor. Writers like you have an editor within you as well, which is why you’re so self-critical. You end up seeing problems that not even your editor notices, and you end up cutting things out of your work. Miura: I see… I wonder if it’s too late for me to change my attitude now. Torishima: You can do it. Miura: It’s true that I make the first chapter really dense, and I end up being unproductive as a result. Maybe I can slow down a little. Miura: I guess I need to make it more manga-like. I keep being influenced by the various manga that left a mark on me during high school. You’re right, though, it’d be more tasteful to try to move my audience with just a single pen stroke. Torishima: Anyone can do addition with enough time, but subtraction takes brains. You ought to do more subtraction. Also, your personality is too pure and sincere. I’m amazed that you lived your life so long with such purity (laughs). Miura: I have to agree. I’ll start making an effort, beginning with my current manuscript. I’ve been making manga all this time without ever changing my style. I think I’m beginning to outgrow it. Torishima: It’s definitely not fitting you. You should take it so far that it starts feeling sarcastic. Like me; I’m a very sarcastic person. Let’s be sarcastic together while I’m at Hakusensha (laughs). Torishima: I’ve worked really hard all this time, battling this thing known as “talent.” My sole motivation is to discover talent and to show it to the world – to see it proliferate. Q: Getting back to that, what exactly is author’s “talent” to you? Torishima: I think it’s a dog in a cage. It’s trapped within the author, and its instinct is to get out. Talent is that rush – that hunger. And the editor’s job is to train that dog. As ravenous as it may be, if it isn’t given direction, that talent goes to waste. As I keep saying, the job of the editor is to create order, after all. 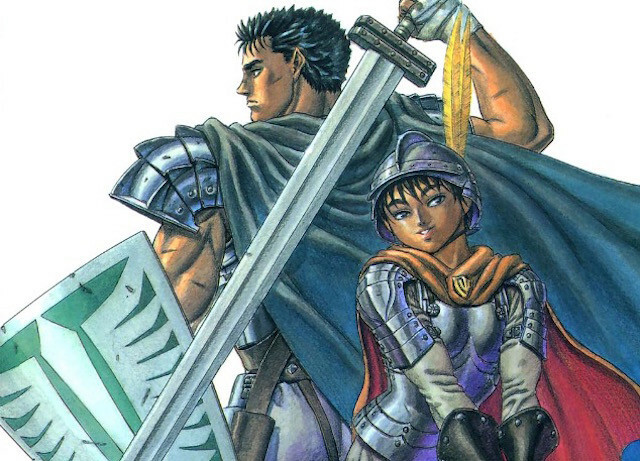 Miura: Do you think Berserk is chaotic and lacking in order, too? Torishima: No, if anything, Berserk is too orderly right now. That’s why it’s so painful. It’s too sincere. Miura: I’d like to ask about the manga industry, too; compared to the Showa period (when the Internet didn’t exist) I feel as though the Internet and other mediums are destroying it. It’s not looking too well. Torishima: It’s doing fine. It doesn’t have anything to do with the Internet or anything else; it’s just that there aren’t as many interesting manga these days. And it looks as though there’s a lot of new stuff, but the truth is that media itself isn’t growing. For example, there might be more aggregate websites, but it’s not that there’s more original expressions. Miura: What do you mean when you say, “original expression”? Miura: Perhaps you disagree, but I believe that the times and technology have an impact on people. Especially in modern times, with social networks and messaging services like LINE becoming popular, the young are always in contact with each other. They never learn to confront their own selves. So I don’t know if they’re getting a head-start, or if it’s something else entirely. Torishima: I don’t know what the reality is, so I can’t really comment. First, you have to know the truth of the matter. You have to really observe the youth. Q: Speaking of which, you mentioned earlier that there are fewer interesting manga these days. I hear it often said that, with all the diversification, people just don’t know what “interesting” is. Torishima: The word “interesting,” “omoshiroi” in Japanese, is written with the characters for “surface” and “white.” In other words, “interesting” is something that can be written on a blank page. It’s interesting because it exposes you to values that had never existed before. It’s not interesting if you’re just tracing over something that already exists. Miura: Speaking from personal experience, it’s virtually impossible to be original in terms of ideas. So I think that something that’s original is something that can’t be done by anyone but you. Also, you predicted in the past that gaming was about to take off. Is there something that you think is about to take off right now? Torishima: I don’t know, maybe because I’m not feeling anything, or maybe because I’m getting old. I wonder which. Q: You did feel gaming coming along, though? Torishima: I did. It was partly because I was interested in it, too. Miura: I consume more anime and light novels and Niconico videos these days, too. Manga is too grand; it’s hard to do all of it. I do keep an eye on the manga that gets anime adaptations, though. Q: President Torishima, do you have any pure hobbies, unrelated to your work? Torishima: I do not. Everything relates to my work. Miura: You end up making use of everything, when you’re the kind of person who contemplates your purpose in life. All my choices are dictated by whether or not I can apply it to manga, too. I thought that’s just how manga authors are, but I learned quite late that not all manga artists are that way (laughs). Torishima: Of course not (laughs). Editor Torishima’s Final Story Meeting! 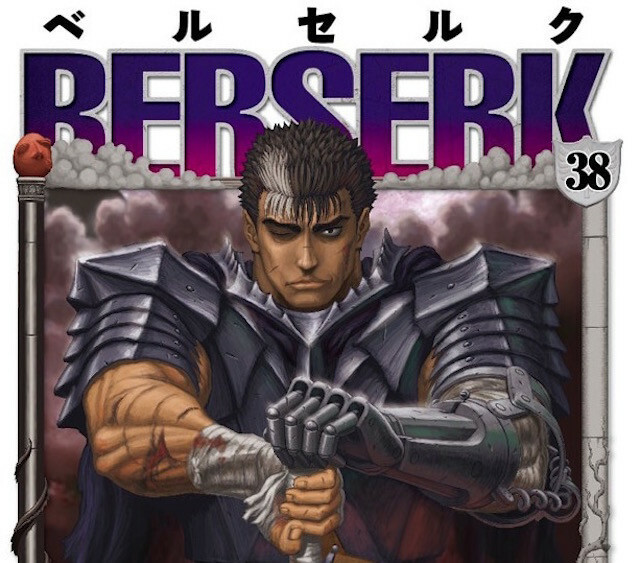 Torishima: Miura-sensei, why do you work on Berserk? Miura: At first, it was because it was my first serial. But now, I’m just determined to see it through to its end, properly. Torishima: Then may I ask; why do you create manga at all? Miura: It’s my instinct, I suppose. It was something I longed for as a child, and I ended up where I am now after a lot of effort. Torishima: It must be that you’re trying to recreate something that you felt when you were most emotionally receptive. You’re a rare kind. It’s a losing battle, though, if that’s all you’ve got. Miura: I do want to express the awe that I felt in the past, of course, but I also do have an urge to incorporate the new things that have become me. It’s just that I can’t apply it very well to Berserk. Torishima: I think you should just do it. I wouldn’t mind being your editor if you start a new series (laughs). Miura: Really?! That could be fun (laughs). How about the piece that I’m cooking up right now? Torishima: I bet it’ll make me want to draw for it myself. It could end up being Editor Torishima’s final story meeting (laughs). Miura: When you were working on Dr. Slump with Toriyama Akira-sensei, did Toriyama-sensei do the original conceptualization, while you gave it polish? Torishima: Yup. I don’t ever bring anything new to the table myself. I just ask questions and clean things up. Miura: I’d have to bring something really worthwhile, then (laughs). Torishima: Nah, don’t worry, I’m a straightforward guy. I’ll be fair! Q: We’re almost out of time. Miura-sensei, how did you feel about today’s talk with President Torishima? Miura: I’ve been getting a bit bigheaded lately. I think Torishima-san has given me an opportunity to break through that with his stimulating words. Torishima: In my view, Miura-sensei, you’re still letting your talent go to waste. I want you to keep asking, “What am I looking at? Is it correct?” For example, you do a lot of research for the sake of your work, but you shouldn’t! Why? Because you aren’t the kind of author that needs to study. You have the art and the storyline all in your head. Miura: I never thought of it that way. I should be more untamed, I suppose, is what you’re saying? Torishima: Just be as you are. Like I keep saying, if I were your editor, I wouldn’t have let you have Griffith fall. I know you felt good, going all-out in Volume 13, but at that moment, I imagine you lost all motivation. Miura: I don’t know if motivation is the right word, but I did give it everything I had between the Band of the Hawk and the Eclipse, so I had to put a lot of thought into it following that. Torishima: I think you did it deliberately; you did the series in order to write Volume 13. All the more, you must have regretted it. 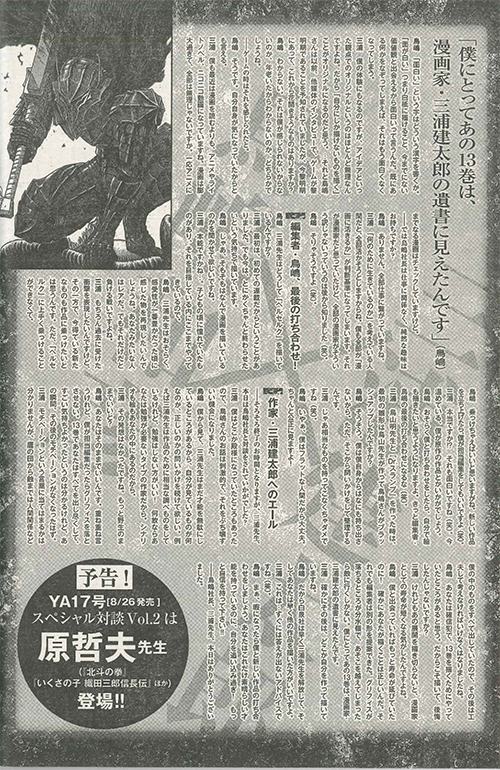 Miura: I felt as though my shelf life as a manga author would have gone down if I hadn’t made that development. Torishima: You could have lasted longer if you’d met me! What you did was correct, but an editor could have given you other options. Griffith’s turn was pivotal; after that, the Eclipse was inevitable. To me, Volume 13 looked like a farewell note to your life as a manga author. Miura: You’re right, I did have to recreate myself after that in order to keep writing. Torishima: That’s why Hakusensha ought to free you up, and why you ought to start working on a new series. Miura: That’s… not a piece of advice I can give an immediate answer to (laughs). Torishima: Anyway, let’s talk about a new piece whenever you have some time. You have great talent; you should stop being so hard on yourself! Have more confidence in yourself! Q: President Torishima, Miura-sensei, thank you very much.